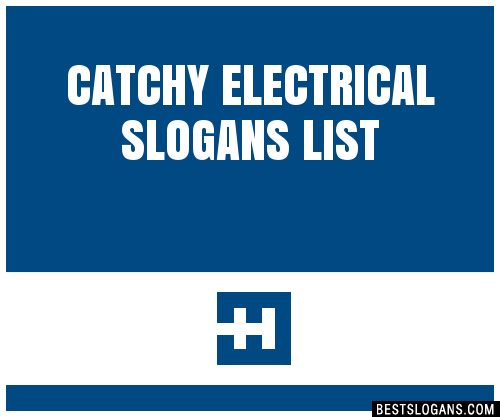 Great electrical slogan ideas inc list of the top sayings, phrases, taglines & names with picture examples. Here we've provide a compiled a list of the best electrical slogan ideas, taglines, business mottos and sayings we could find. The results compiled are acquired by taking your search "electrical" and breaking it down to search through our database for relevant content. 1 Dont be a fool! Inspect your electrical tools. 2 Dont be a stranger to electrical danger. 3 Electrical hazard can shock you - use safety clothing. 4 Electrical Safety is no accident. 5 Ensure electrical safety, save life save property. 6 Practice electrical safety so you dont get shocked. 7 Stay healthy, use electrical extension cord wisely. 8 Take CHARGE for electrical safety. 9 The importance of electrical safety is shocking. 10 Always keep current on electrical fire safety. 11 An electrical current can produce shocking results. 12 An electrical octopus may be fast, but for safety reasons, it won't last. 13 An electrical surprise could end in demise. 14 Are you keeping current on electrical safety? Are your power tools grounded? 15 Be careful around electrical power or it could be your final hour. 16 Be ever ready with electrical safety. 17 Comply with the electrical code and do not overload. 18 Don't overload electrical sources or you could get the final shock of your life. 19 Electrical cord with poor insulation often ends with fibrillation. 20 Electrical equipment, no matter how large or small, before fixing, unplug them all!